On that day, and in that place (72nd Street and Fifth Avenue entrance, BTW), Diane Wolkstein will officially open the Central Park story season. That season’s schedule has been finalized, and here it is (as always, subject to unannounced changes). The stories start at 11:00 a.m. Eastern each Saturday from June 2nd to September 29th. Note: Schedules for previous years are available on the web: 2000, 1999, 1998, 1996. 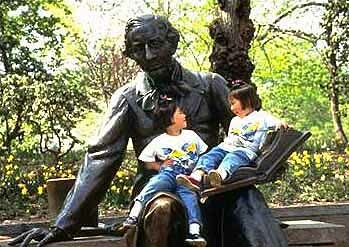 Make sure to visit the Hans Christian Andersen Storytelling Center Web site. It has now been more than four decades since the Statue of Hans Christian Andersen was unveiled in New York City’s Central Park. There have been many tellers entertaining the old and the young alike every summer since 1956...but I believe Diane Wolkstein - who made her début in 1966 - will be the most fondly remembered. Hans Christian Andersen in Central Park is the storyteller’s first album (made in 1982), and it should serve as the best introduction to anyone hearing her or Andersen’s stories for the first time. Aided by musicians Shirley Keller, Janet Stuart, and Rachel Zucker (the storyteller’s daughter), Diane Wolkstein’s voice carries the listener through six of the Danish master’s tales - not just familiar ones such as “The Ugly Duckling” and “The Emperor’s New Clothes” but also such finds as “The Goblin and the Grocer” and the uproarious “Hans Clodhopper.” I love it when a great story is told well, and Wolkstein - who was named “the official storyteller” of New York City in the late 1960’s - is that city’s greatest treasure.